For years, Muslim domestic violence victims did not have access to a shelter which offered a culturally and religiously competent environment. But Asiyah Women’s Center, the first Muslim women’s shelter to open in New York City for domestic violence victims, is offering transitional housing which has been lacking for years. “One of the utmost urgent service needed is a Muslim women’s shelter, and not just a women shelter but one specifically related to domestic violence,” asserts Abu Mohammed, Volunteer at Asiyah Women’s Center (WC). Asiyah WC, located near Sunset Park in Brooklyn, is a private home owned by a member of the Muslim community that has been converted to a safe space for women and children and is run solely by community volunteers. The residential house has six bedrooms, two bathrooms, a kitchen, a dining and living room and can house approximately 20 residents at a time. “We try to make the place homey and welcoming, not like regular shelters where everything is metal,” says Mohammed. There are multiple non-profit organizations spread out across New York City which are providing support and counseling to domestic violence victims and survivors in the Muslim community. However, building a shelter for these victims has always remained an unaccomplished goal. Apart from Asiyah WC, there is another shelter service dedicated to Muslim women called The Islamic Center of North America (ICNA), located in Jamaica, Queens. However, ICNA does not accept domestic violence victims due to liability concerns, such as maintaining privacy and confidentiality. “Opening a physical place is always a liability. I always found that to be strange. These women are being abused on a daily basis. There needs to be a sense of urgency. If you’re going to dedicate an organization to empowering women, there is no need greater than to build a women’s family shelter. It’s not the lack of funding, political connections or support, its liability,” says Mohammed. Women for Afghan Women (WAW) through its cultural competency has changed the way domestic violence is approached in the Afghan community. We have tried to make the topic of domestic violence less taboo in our community “just by talking about it,” says Naheed Samadi Bahram, Program Director at Women for Afghan Women based in Fresh Meadows. “WAW makes sure to create a peaceful and safe space for the women and the children, which makes the clients trust us,” she says. 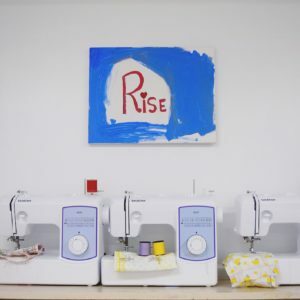 In addition to holding informative educational trainings on the topic of domestic violence with local mosques, this past summer WAW has held a four-week vocational sewing workshop for domestic violence victims and survivors in an effort to economically empower these women. Sewing machines from the vocational workshop held for domestic violence victims and survivors at Women for Afghan Women (WAW). Most domestic violence victims in the Muslim community in New York are immigrants, sometimes making English an additional barrier in open communication between the victim and traditional shelters. Shana Bhattacharya, Manager of Institutional Giving at Sakhi for South Asian Women, an organization dedicated to eradicating violence against women, recalls an incident of a recent client who in addition to being a domestic violence victim, had been sexually assaulted. The client because of language barriers was unable to express her sexual assault in English. Therefore for days the shelter was oblivious to the fact that the client was a sexual assault victim until Sakhi was contacted to translate. “Priority of Sakhi right now is to address the need for transitional housing in the community and we are hoping to implement that,” says Bhattacharya. The international ties of immigrants can add a layer of difficulty when helping these victims. One of the residents at Asiyah WC, whose name we are not disclosing for her own protection, at the age of 35 broke free from an abusive relationship of almost 15 years. She was then sent to Jordan by her husband and was nearly killed there. She managed to make her way back to New York City and resided with Asiyah WC for a few nights. She is now fighting for the custody of her 9 year old son. Asiyah WC is currently a shelter space available only on a week to week basis due to limited resources. But in the 3 months that it has been open, Asiyah WC has been able to help its residents find more permanent housing, employment, access to legal services, and gain custody of their children. “The women need a tangible space to escape, they depend on their abuser to provide a roof over their head. When we created Asiyah WC, women felt empowered. They were able to break that cycle of abuse and finally breathe in a safe space after years,” says Mohammed.